The German and Dutch colonists who settled the rural areas of Pennsylvania and New York in the late 17th century were heirs not only to the cooking and eating traditions of their homelands in Northern Europe, but the cooking technologies as well. 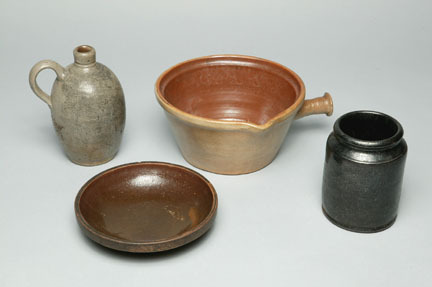 The Rietz Collection of Food Technology includes about fifty pieces of household ceramic containers used in preparing and storing food that reflect the traditions of the German and Dutch foodways continued in North America. Produced mainly in the 18th century for common domestic purposes such as dairying and cheese production, these objects clearly reflect the influence of Northern European ceramic traditions.